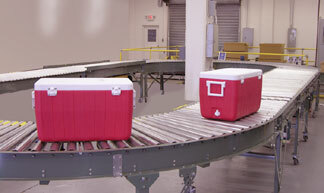 The test loop features a variety of conveyors, diverters, transfers, and accessories needed for a proposed system. Product can be shipped in to Hytrol, tested, videoed, and the product returned to the customer. One of the services Cisco-Eagle’s customers have at their disposal is Hytrol's sample product test program. 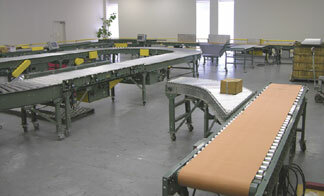 Selected conveyor model sections are set up to run product samples in order to confirm conveying requirements. If you’re considering a system, testing is available. To take advantage of this service, contact Cisco-Eagle and request a product test on Hytrol conveying equipment. We’ll take it from there. Hytrol will then set up a test run using either sample product from you, or simulated product based on size and weight. The information obtained from product tests can be invaluable in determining proper conveyor model selection, speeds, angles, and turning data. Your test product will be returned after it’s been run through the process. Test results and recommendations will be documented and passed along in any format you request, including a custom video of the test. We can often take you to the testing facility to see the test run, if you want. Hytrol recently added the R&D test loop, an 80 ft. long x 33” BR (Between Rail) oval equipped with the latest roller conveyor models. The loop’s straight sections utilize ABEZ and ACC accumulating conveyor, with LRC and NSPEZC curve conveyors in the curves. A CT-200 chain transfer and a v-belt transfer can also be brought into the loop. This Test Loop can accommodate a wide variety of product tests as well as help us to check out new conveyor component parts. A test run will ensure we have the right conveyor for the product, and help us avoid misapplication issues in the field. The product test service and video is absolutely free. For testing eligibility, contact Cisco-Eagle.